It's official, professional triathlete, Felipe Bastos, is truly the 'King of the Hill'. On, August 4th, Bastos set a course record of 1 hour, 28 minutes at the challenging. Tupelo triathlon set in Tombigbee State Park, Tupelo, Mississippi. Bastos rode his Velo Vie Veloce at a blistering pace, only seconds away from the record for the bike leg of this event. Bastos has had an outstanding season thus far, racing and training on two of Velo Vie's top of the line bicycles. Bastos puts miles in on his Vitesse 300 road bike, building speed and endurance in challenging group rides. For races, Bastos brings out the big guns with the Velo Vie Veloce. "The Veloce performed just as I expected it to; fast and smooth. The frame is super aero, and I could see its advantage on every downhill," says Bastos. 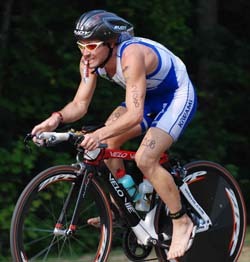 Keep an eye out for Felipe Bastos and the VeloVie Veloce at IronMan Louisville taking place in Louisville, Kentucky on August 26, 2007.